When Thomas McElrath took over as insect collection manager at the Illinois Natural History Survey (INHS) in 2017, he inherited one heck of a meltdown. 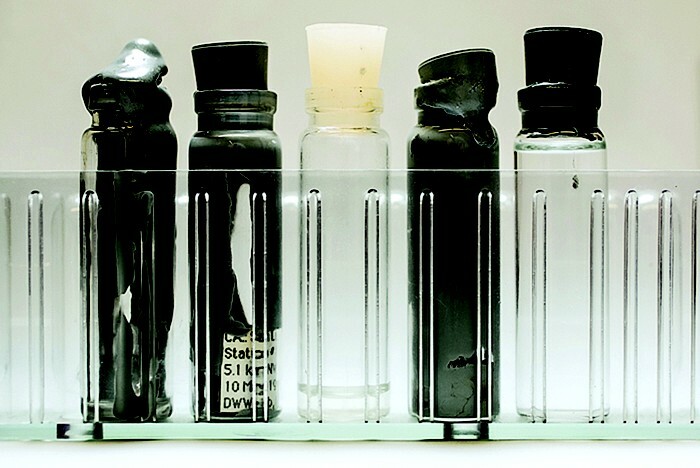 Synthetic rubber stoppers that for decades contained specimens in more than 300,000 vials had begun to degrade in a way that resembled melting. “And they are melting in different ways, which is fun,” McElrath tells Newscripts. Stoppers that are light gray ooze into the vials, sometimes forming a seal. Those specimens are “encased in a pretty much undissolvable, horrible goo” and are lost forever, McElrath says. Stoppers that are dark gray are less destructive, but they form a sticky mess that’s a bear to work with. Andino Martinez will recruit undergrads to investigate how the material’s composition may have changed over time. He predicts that most of the caps will degrade eventually but stops short of placing blame. “People who put those caps on vials 30 years ago couldn’t predict something like this would happen,” he says. Right now, McElrath is focused on salvaging the Hymenoptera—that’s bees, wasps, and ants—and the Araneae—that’s spiders. INHS is finishing up a grant from the National Science Foundation that funds the transfer of its spiders to new vials with plastic screw-tops. So far, a team of employees and volunteers has made it through about a third of INHS’s entire collection. While team members are transferring, they often record data about the specimens to be shared with researchers around the world. “Each of these vials is a data point in a larger study,” McElrath says. Art history majors who thought they had safely avoided biology should think again. Elisabetta Caselli, a clinical microbiologist at the University of Ferrara, has turned her focus to the microbiome of antique paintings (PLOS One 2018, DOI: 10.1371/journal.pone.0207630). Caselli’s usual beat has her tracking bacteria populations in hospitals, but she switched her focus as part of an interdisciplinary project to restore Incoronazione della Vergine, a 1620 painting (shown) attributed to the Italian baroque painter Carlo Bononi. The painting, usually housed in the Basilica of Santa Maria, was damaged when an earthquake struck Ferrara in 2012. As it turns out, the painting was being further degraded by bacteria and fungi snacking on its pigments. Caselli’s team set out to document the biodeterioration process and to characterize the cast of microbial characters that populate the painting. The researchers sampled 4 mm2 sections from various areas of the work. Their hunt turned up a diverse population that varied depending on light, temperature, humidity, and nutrient availability. Certain microbes preferred certain pigments. For example, species of Aspergillus and Penicillium liked the dark brown of the angels’ garments, while Cladosporium gravitated toward the lighter pinks and yellows of the sky. The team also saw evidence that introducing strains of Bacillus, commonly used in hospital sanitation, could control the teeming masses of pigment-munching microbes. But they still need to ensure that Bacillus won’t do some biodegrading of its own.